To coincide with the launch of our new ‘royal’ wedding venue – a charming summerhouse specially built for Queen Victoria - we look back at the Queen’s historic 19th century visit. Queen Victoria’s visit to the Scottish Borders, just over 150 years ago, was a momentous occasion. Her Majesty and four of her children travelled by train from Windsor to Carlisle, where the new State saloon carriage was found to be too wide for some of the bridges on the Waverley Line between Carlisle and Edinburgh and a new carriage had to be found. 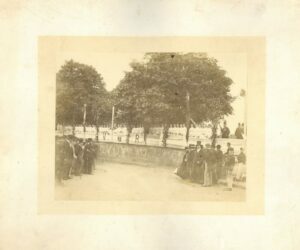 At Sheddon Park in Kelso, a procession comprising magistrates, clergy, a reception committee, Freemasons, volunteers and bands marched to Kelso Bridge where the Queen was to enter the town from the railway station. Houses were decorated with flags and flowers, pavements thronged and windows and housetops were occupied by hundreds of spectators. A line of 50 ‘young ladies’ ready to scatter petals. 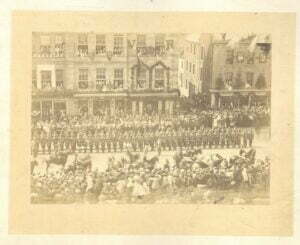 Queen Victoria’s procession through Kelso 1867. According to a London Illustrated News report of the visit, on alighting at Kelso Station, a band of the Peebles Volunteers struck up God Save the Queen and Her Majesty was greeted by a welcoming party that included the Duke and Duchess of Roxburghe with their eldest son, the Marquis of Bowmont, the Duke of Buccleuch, Lord and Lady Charles Innes Kerr, the Sheriff and other county officials, and a number of Army personnel. A landing stage and pavilion had been erected for the occasion, beautifully carpeted and covered with red and white calico, wreaths of laurel and heather, other floral decorations and drapes of Victoria tartan. The station lamps were painted with Royal arms. The Queen travelled through Maxwellheugh to Kelso bridge, where a magnificent triumphal arch had been erected bearing God Save the Queen in flowers. Another beautifully decorated platform featured 50 “young ladies” dressed in white, each with a basket of flowers that they scattered as Queen Victoria approached. Another Royal Arch with Welcome to Tweedside had been created and two platforms filled with schoolchildren lined Roxburghe Street. On each side of the entrance to Floors Castle, further platforms containing around 260 workers from the Castle and their wives greeted the Queen. The guns at Roxburghe Castle fired a salute when the Royal Standard was hoisted on Her Majesty’s arrival at Floors. In the evening, Kelso was brilliantly illuminated using padella lights, gas jet lighting and lime light and the crowds from earlier in the day were joined by others to witness the spectacle. All of the beacons in Upper Teviotdale were lit in celebration, a scene not witnessed since 1804 when a false alarm set this early warning system, designed to communicate a French invasion, into action. The signal was a shower of rockets from Floors Castle and the cue was taken up by Upper Teviotdale, the summit of Minto, Verticle Hill, Crumhaugh Hill, Stobs Hill, Penchristpen, Caldcleugh, Greatmore Fell, Kirkhill, FInnis, Cardy Hill, Heronhill and Stirches. The fires burned for most of the night. Queen Victoria visited Melrose and Sir Walter Scott’s Abbotsford home on the Thursday afternoon, and Jedburgh on Friday, before departing Kelso on Friday night on her way to Balmoral. During her stay here at Floors Castle, Queen Victoria took afternoon tea in a specially built summerhouse in the gardens. This was recently refurbished by Her Grace, The Duchess of Roxburghe, an interior designer, and is now available as a wedding venue. It provides a stunning setting for intimate ceremonies, or for use as part of a larger Garden wedding.